The first time I made this was late January 2019. I am not sure how many times I will make it in the future. If the first night is any indication, we will make it a few times. I decided to explore a different option for a chuck roast that didn’t want to be accompanied by potatoes and carrots. When I stumbled on this recipe, it allowed me to fulfill a promise I made to my son. 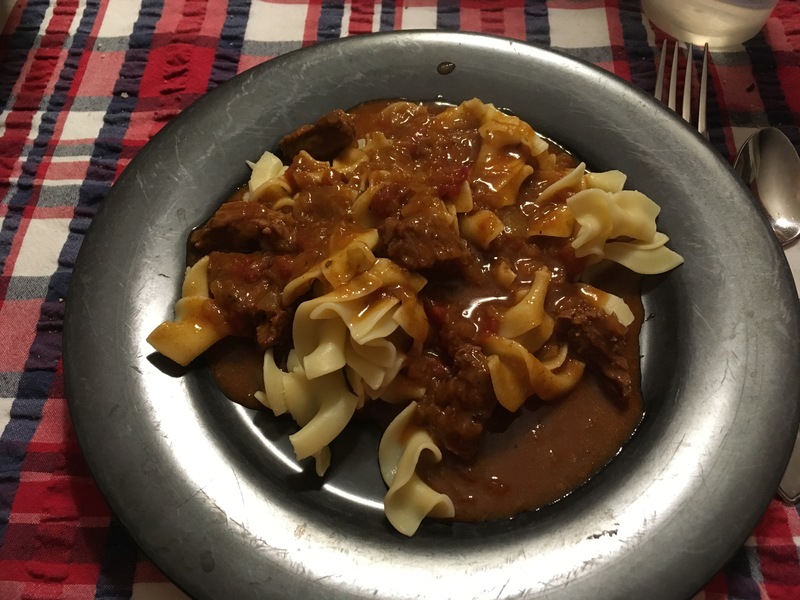 “I will try making goulash one of these days.” The only change I made the first time was using a slightly bigger roast than the one recommended. Sear the beef in three batches: Heat the vegetable oil and butter in the pot over medium heat (Sauté mode set to medium in an Instant Pot) until the butter stops foaming. While the pot heats, sprinkle the beef cubes with 1 ½ teaspoons salt. Add 1/3 of the beef in a loose single layer and sear until well browned on one side, about 3 minutes. (Don’t crowd the pot or the beef will steam, not brown). Transfer the browned beef to a bowl, add half of the remaining beef to the pot, and sear until browned on one side, about 3 more minutes. Transfer the browned beef to the bowl. Add the rest of the beef to the pot and sear until browned on one side, about 3 more minutes. Transfer the browned beef to the bowl. Sauté the onions: Add the onions to the pot and sprinkle with ½ teaspoon salt. Sauté until the onions soften, about 8 minutes, stirring and scraping the bottom of the pot occasionally to loosen any browned bits of beef. Stir everything into the pot: Stir in the beef and any juices in the bowl. Sprinkle the paprika and caraway into the pot and stir to coat the beef. Stir the beef broth and tomatoes into the pot. Pressure cook the stew for 15 minutes with a natural pressure release: Lock the lid on the pressure cooker. Cook at high pressure for 15 minutes in an electric pressure cooker (“Manual” or “Pressure Cook” mode in an Instant Pot), or for 12 minutes in a stovetop PC. Let the pressure come down naturally, about 20 more minutes. (If you’re in a hurry, you can quick release any remaining pressure after 15 minutes.) Remove the lid, tilting it away from you to avoid the hot steam. Thicken, season and serve: Whisk the water and cornstarch together to make a cornstarch slurry, and then stir the slurry into the stew. Stir in salt and pepper: If you used store-bought beef broth, add ½ teaspoon of fine sea salt; if you used homemade beef broth or water, add 1½ teaspoons of fine sea salt. Also, add ½ teaspoon of fresh ground black pepper. Serve over egg noodles with a spoonful of sour cream on top. Enjoy! The downside to pressure cooking is a thin sauce. The sealed pressure cooker lets us build pressure, but we don’t get any evaporation to thicken up the sauce. The cornstarch slurry thickens the sauce and gives it the mouthfeel of a long-simmered stew. You can substitute chuck roast for the bottom round roast if that’s what’s available; everything else cooks the same.